Just as I approached on the long walk back up the paved road (the former Grand Loop Road), Castle obliged me with my fourth major eruption of the day at about 2:25 pm. But that was not all! After some sustenance and a rest, I took off again for the early evening eruption of Great Fountain. A few minutes after establishing myself with a book on the viewing bench, my neighbors on the bench and I struck up a conversation. Nine-year-old Emma from Portland wanted to tell me all about her many trips to the park and environs and to pick my brains about what I knew, so the book was put away. I timed the first overflow of Great Fountain at 6:38 and knew we still had at least 45 minutes to wait, so I asked Emma if she’d like to walk back along the road to see Surprise Pool and Firehole Spring. She asked her father’s permission, and off we went. Like me, she was mesmerized watching the big white bubble of steam rise over and over in Firehole Spring and sometimes burst at the surface. And I had to scold her father for never stopping there on the way to Great Fountain. Nevertheless, Emma had a one-up on me, when she said she’d been to Oblique Geyser—and I haven’t. I’m more inclined to call it Avalanche Geyser (see “A Yellowstone rock in the Smithsonian, Part II“—but I’ve never been there. In contrast, Great Fountain begins rather tentatively (and may have a blue bubble at its base, but not this time). It seems to die back, then surges up again numerous times. I watched for only 20 minutes but suspect it went on longer. And so to rest, with visions of spouting waters to last me another year. 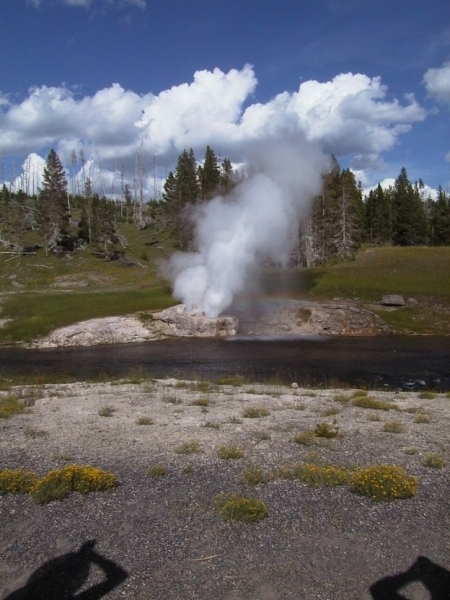 CREDIT: The photo of Riverside Geyser was taken by my son-in-law Niklas Dellby on August 5, 2004.